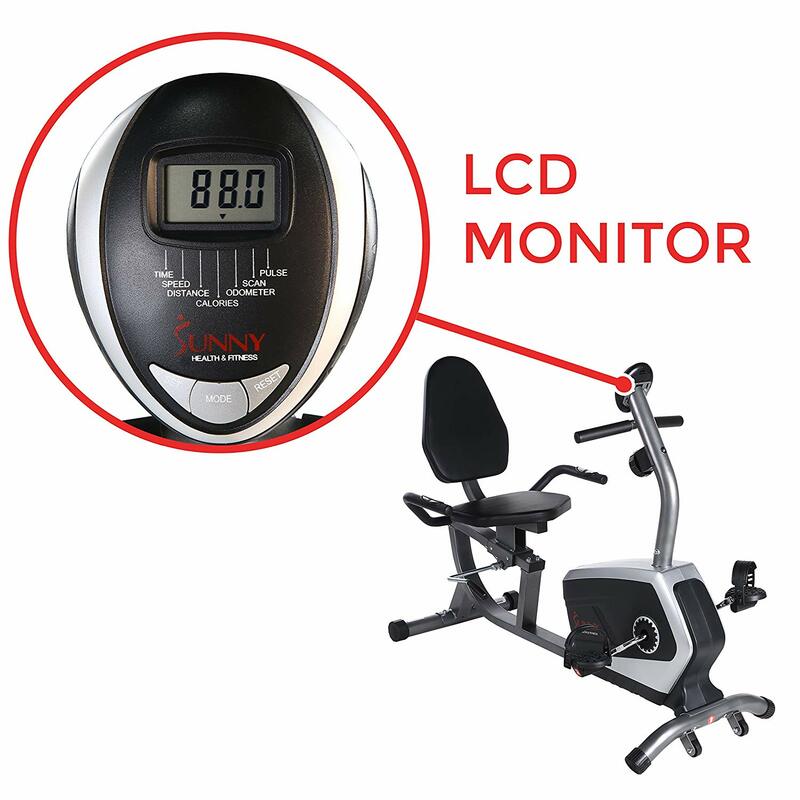 While looking for recumbent exercise bike for home use, I found this bike from a quite strange manufacturer – Sunny Health & Fitness. It has been operating over a decade with the health and fitness product line, as those from Marcy or Exerpeutic. What holds me for a few seconds glance at this bike is its price and nice look in gray. Another features that I am curious about are the adjustment brake and small handlebar under the screen. The brake is advertised as “seat adjustment without getting off the bike”, which sounds quite convenient. Take a glance at it, this bike has a compact recumbent design, with sturdy frame system hided inside, covered with dark gray color. Let’s dive to see what basic features this bike from Sunny Health and Fitness possesses. 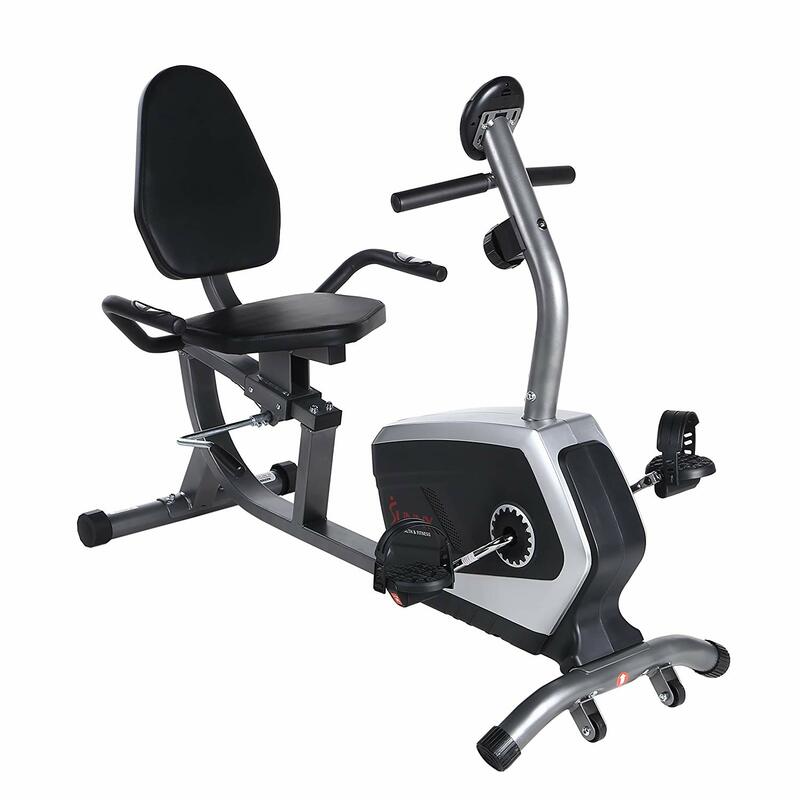 As a standard recumbent exercise bike, it is equipped with pedals, LCD screen, seat, backrest, tension adjustment knob, side handlebars and transported wheels underneath. Moreover, what make it special over other recumbent models are a brake handle to adjust the seat position and additional front small handlebar, which is located under the screen. To be clearer, recumbent bike is designed to support the sit-and-biking position that has the pedals placed on the same level with the seat, enabling user to stretch their legs horizontally and leaning on the seat. Additionally, the main difference of recumbent design over another popular one, “Upright”, is the backrest. 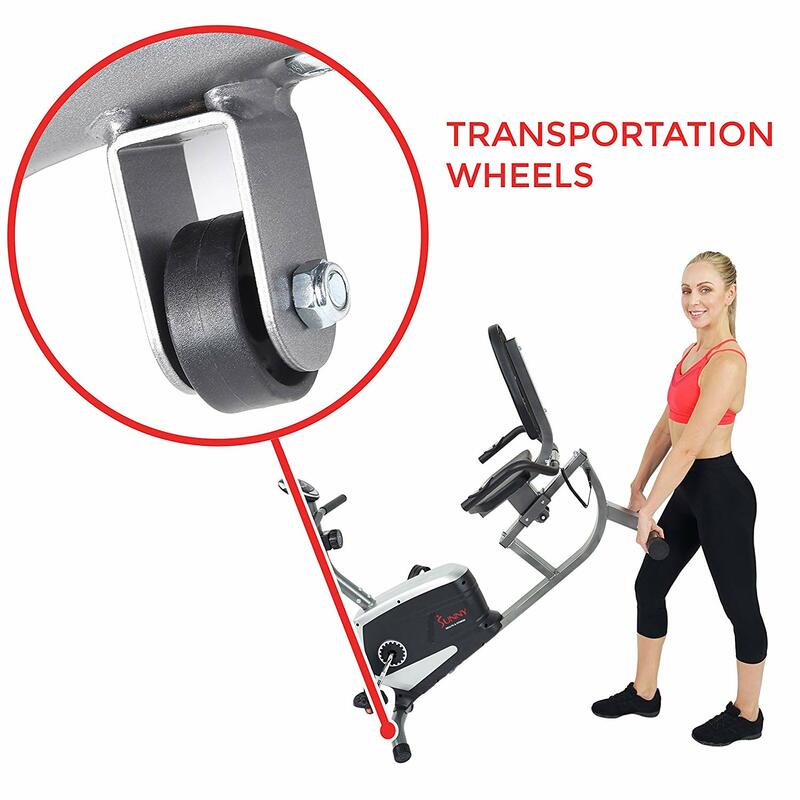 With an upright bike, user has to be in a forward riding position, such as that of normal bicycle; meanwhile, recumbent bike allows them to comfortably lean back, reducing most of the stress caused on back. This is the design for those who finds an upright bike is too tough for them, or those who are recovering from a back treatment or knee replacement for instance. With cushion seat and comfortable back support, this bike is remarkably suitable for people who have problem with their hip, or those simply need a more relaxed exercising experience. This bike is easily assembled with well-instructed manual. However, I have some difficulty connect the wires inside the tube, as there is small space to see. The bike has sturdy frame and hence, can carry user weight up to 300lbs. This is quite a wide capacity range which is suitable for almost every housewives, white-collar people to do their daily exercising at home. 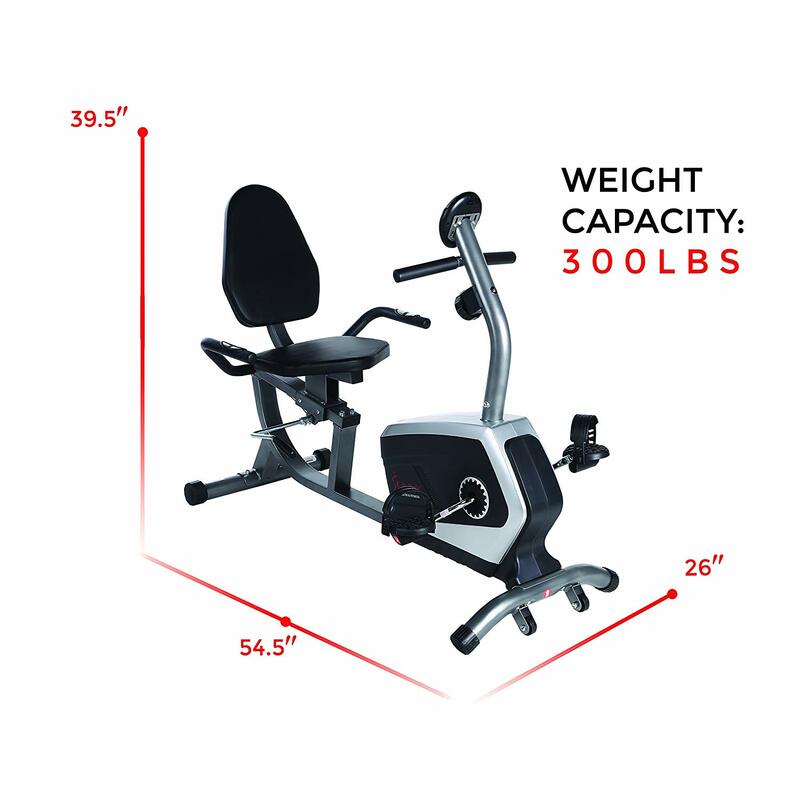 Regarding the remarkable capacity, it is designed for both muscle toning and fat burning purpose. Especially when the people’s sitting hours is getting higher and higher, it will harm to different parts of your body and cause some health problem, such as obesity. Therefore, this home bike is convenient for overweight and obese people to burn out calories and get in shape. Although the advisable weight limit is 300lbs, the bike is so sturdy that it can actually support some additional weights, around 10lbs more, so now if you are like 308lbs, do not hesitate if it is for you or not. Just get in and lose some weights. User could do exercise with it almost everyday, for any training purpose. Notice that this is not for children, as the dimension and height are designed for adult users. The bike has the magnetic tension system, offering 8 different preset-levels. Depending on the workout purpose as well as exercises you are pursuing, adjust the the tension to fit yours. 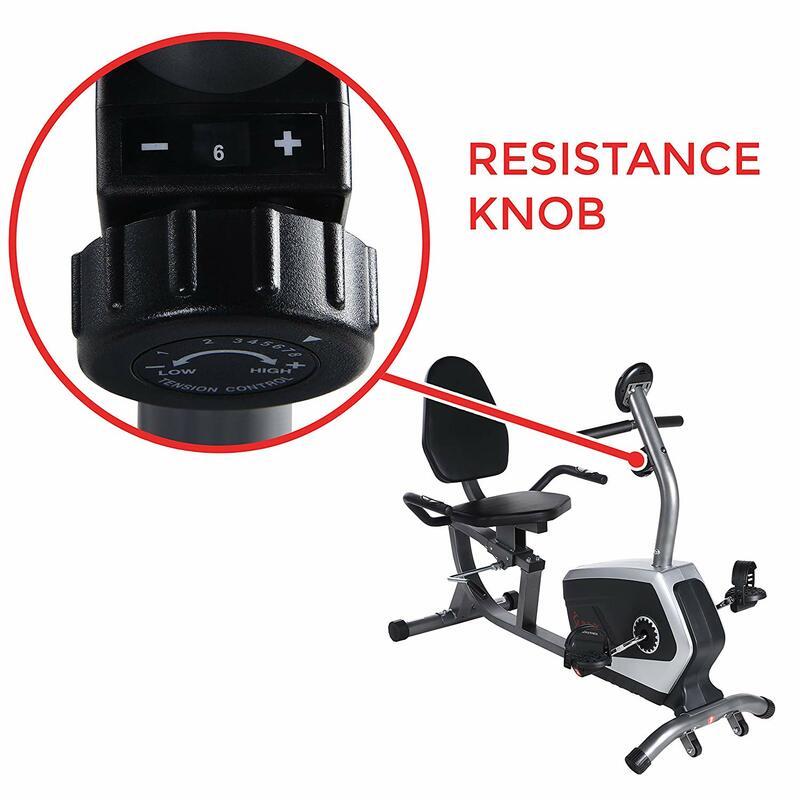 Modification can be done by an rounded adjustment knob in front of the user’s eye level, placed under the small handlebar. It is quite easy to use by rotating the knob clockwise to increase the level and counterclockwise to decrease it. It has plus (+) and minus (-) symbol for user to recognize the direction. It fits almost kinds of exercising, even you are a gymmer or a fitness starter. If you are on a muscle toning program, increase the tension gradually in every set and try to reach new tension level after a few weeks. Regarding fat burning, set the tension as you feel most impacted. It is designed even for those who are experiencing a heart problem; what they need is a low tension at the beginning of the exercise and try to control their heart rate during the training. Despite serving multi-training purpose, this bike’s tension sometimes has problem: it does not work as I try to modify among levels. In these case, I often have to ride it for another few minutes and re-adjust while riding. I think it is the flywheel system that is not very stable all the time, which needs improvement from the manufacturer. Generally, this Sunny Health & Fitness bike has smaller LCD screen than that of Marcy and Exerpeutic bike. It is located on top of the standing frame, which is a bit under the user’s eye level for them to easily observe and keep track with the metrics showed. In addition, the number is displayed in big and clear view, so you need no much effort to read the figure. However, the screen has no LED light, unless you have a direct light from above, you could get difficulty reading it. There are enough basic workout metrics available in the bike, including: Speed, Distance, Time, Calories, Pulse. Each function has quite big range, for example, it allows maximum 100 minutes riding and up to 1000 kcal of calories burned, convenient for long hour workout. Again, depending on the training purpose that users should concentrate on specific metrics. For instance, people are on weight losing program need to focus on calories burned, while others interested in stamina improvement might be concerned with speed and distance riding. There are basically 2 workout mode setting, single function or scan mode. With single one, you choose to show only the most important metric of your exercise. Meanwhile, scan mode will automatically switch to all function in every 4 seconds. This can be selected by 3 buttons: Mode (choose function), Set (set the value of function, e.g 30-minute riding), Reset (reset the time, distance and cal value to zero). The screen runs by batteries: 2 AAA-size or UM-4 is acceptable. Note: they are not included in the package, make sure you have them at home by the package arrival. 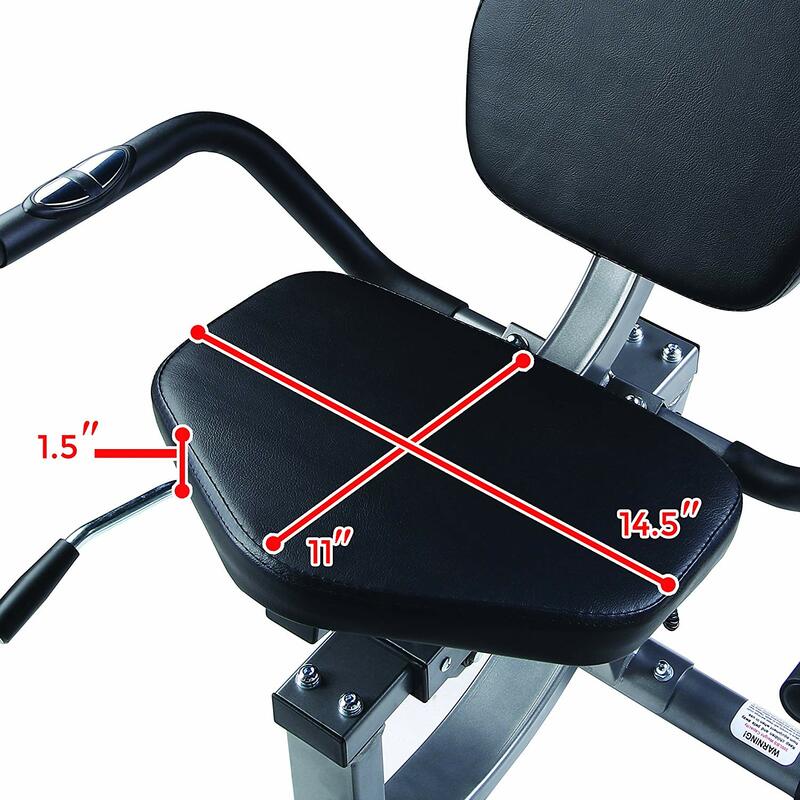 As the important parts of a comfortable recumbent bike, cushion seat and backrest of this bike SF-RB4616 are focused with aim to providing superior comfort. The seat is 14.5 x 11 inch wide, and 1.5 inch thick. 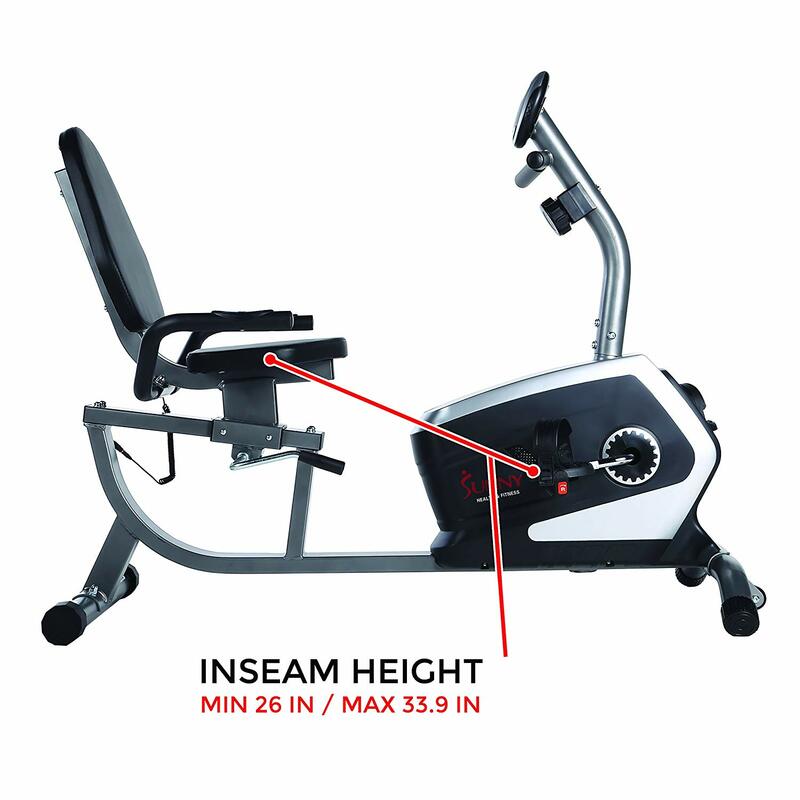 This dimension is considered to be slightly smaller than that other standard recumbent bike, due to its compact design. Therefore, the seat is not so cushy as advertised and would not be comfortable for long exercising.. However, it works fine for 1-hour exercising without any hurting my hip and tailbone. My skinny brother also feels good while riding it 30 minutes everyday. Accordingly, the backrest would bring more comfort if it is available in bigger size as I often rest all backwards and let legs do their job downside. The seat position can be adjusted forward or backward by using the brake side handle. This might be the most noticeable feature of this bike since it allows adjustment during the training, without stepping out. The adjustment works on a slide frame, when you push down the brake handle, move the seat to desired position and pull the handle up to tighten. It offers wide range of leg lengths modification, from 26 inches to 33.9 inches long. The furthest distance from the front of seat to the pedal is 28 inches. In addition to side handlebars, there is a smaller bar right under the screen, supporting forward riding position. While doing in this position, you may need another seat adjustment to perfectly fit into an effective biking. 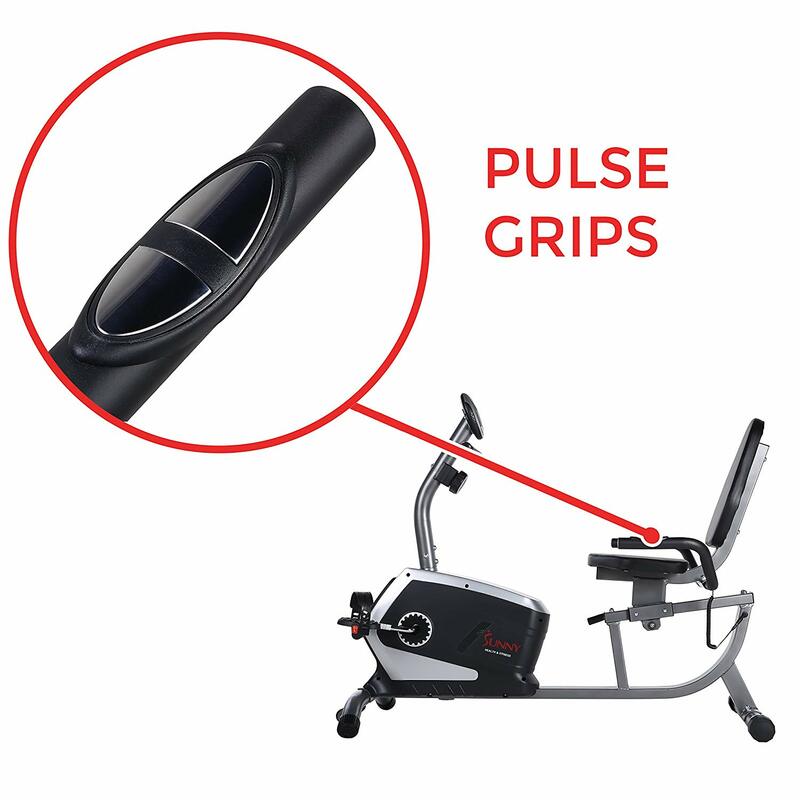 As supporting the pulse rate measurement, a hand pulse sensor system is installed on the surface of side handlebars. It works when user place both hands on the bars during exercise, the sensor will automatically check heart rate and show it on the screen, together with other metrics. Note that you have to place both hands on the bars, otherwise it won’t work. There is no need to activate this function, what you need to do is riding, placing hands on and let the sensor does its job. This function work best for those who might concern about their too high heart rate and need a solution to keep track of it while exercising. It is suitable also for those who are on a workout treatment process to monitor their pulse rate. For instance, they could start at low resistance, about 1 or 2, riding and gradually raise the speed up until it reaches an acceptable heart rate boundary. Relax then and try to bike with the same speed while breathing steadily. One thing you should know about this bike’s sensor is that it might show a bit faster heart rate in 2 or 3 first seconds, after that everything is ok. My advice is when you have your heart beat at a constant rate, that’s when you should place your hands on the bars and start to read after 3 seconds. 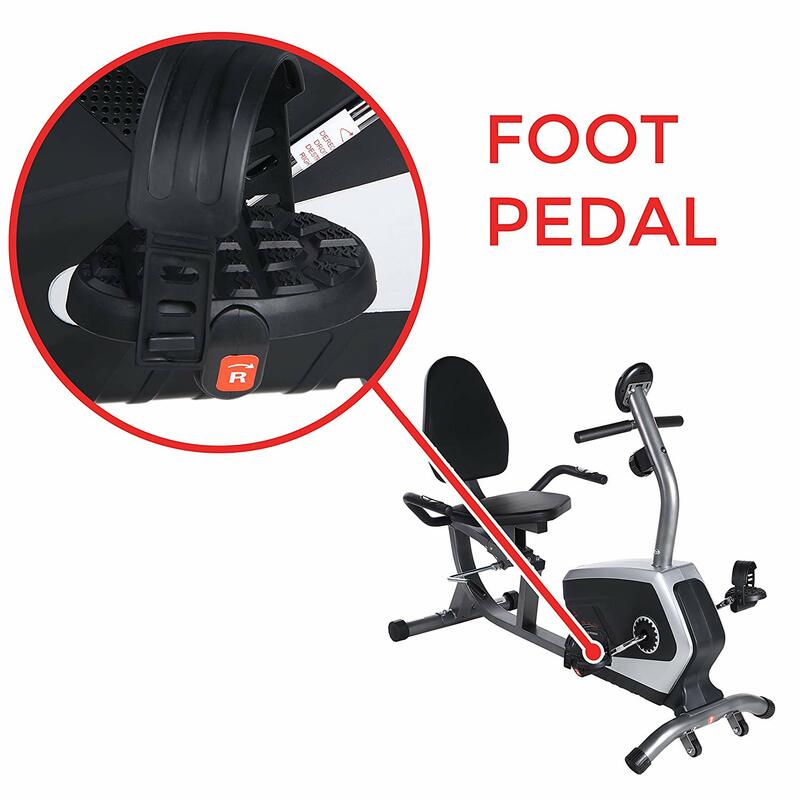 The bike comes with self-leveling pedals together with safety foot straps, which can be fit to almost every size of foot. It allows pedaling both forward and backward, depending on the exercise. 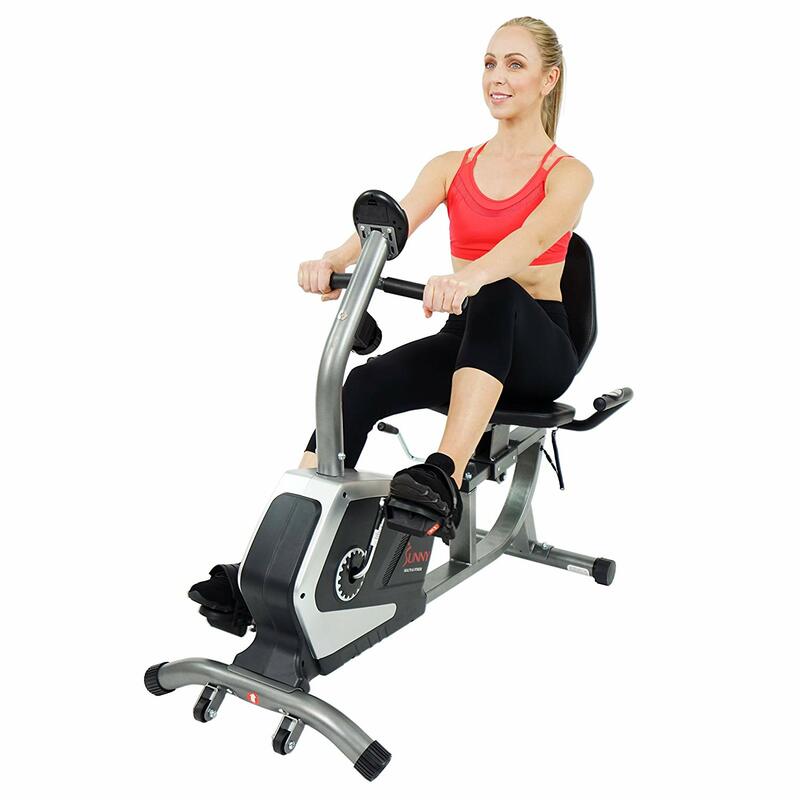 As a distinct of recumbent bike, user can bike with legs being stretch horizontally and feels the most impact on their legs muscle. If you have short or long legs, re-adjust the seat position to have the most comfortable pedaling position. The side handlebars, in addition to have sensor system, are the best support for a more stable riding. Indeed, the faster the speed, the more you need to hold bars to remain balanced. Moreover, the bike is equipped with a smaller handlebar under the screen. This works as a supporter for forward riding position, such as that of upright bike. There are rear stabilizer under the bike which support the balance while using. However, pedals are actually under my expectation. After a few days biking, they start to have some problem with the motion: it is jerky while pedaling and cause annoyed sounds inside. At the beginning I think it has trouble with the high tension; however, it is even worse with low tension. The noise is so annoying that I can not ignore until finishing the workout. The bike weight 59lbs, an acceptable weight for a home exercise equipment. There are 2 wheels under the bike for user to move it around after use. The wheels is friendly with several kinds of floor, including hardwood, tile, berber, flat surfaces; there will be a slight dragging with carpet. The advice is except locate the bike fixed on the carpet, you need to find a space out of carpet for easier transportation after finish exercising. It is much lighter with the help of wheels; thus, it is not a big deal with my parents and little sister. This Sunny Health & Fitness bike needs a regular cleaning and maintenance to notice. After every training, I often take a soft cloth and clean the bike with mild detergent to get rid of some dust and sweat leaved. All the maintenance and troubleshooting instruction can be found quite detailed in the manual. You can leave it in any small space such as room corner, under dining table, etc. It is compact and super-saving space. Warranty period is 3 years for all structural frame defects. 90 days warranty is applied for other components or parts defects. The customer service is a lot supportive but make sure you have the receipt of purchase, otherwise no help will be available. The positive reviews satisfy about its easy assembly, detailed instruction as well as convenient seat adjustment brake, while they need not step out to modify the position. By contrast, others are not pleased with jerky pedaling, unstable tension as well as they find a lot difficult to connect the wires. The price for this home exercise bike is reasonable, regarding its capabilities to fulfill exercise demand, as well as space-saving solution. In general, the bike has compact and space-saving design, suitable for in-home exercise and storage. The sturdy frame supports up to 300lbs weight capacity, a bit more 10lbs in range is acceptable. Although it has 8 resistance level but they don’t usually work well, the flywheel error can sometime occur. The screen is quite small and it will be difficult to read the data in poor light condition. Seat and backrest are considered to be comfortable, but long hours exercise would not be a great idea due to lack of cushion. The adjustment brake is the most noticeable feature while user need not get off the bike to modify the seat position. I am personally not very interested in pedals since they often generate annoying noise and jerky motion while riding, instead of smooth and quiet experience as advertised.